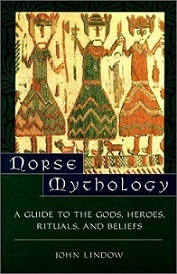 I was looking for way back – as an adult – into Norse mythology; picking up the kindle edition of Norse Mythology: A Guide to the Gods, Heroes, Rituals, and Beliefs by Lindow was a choice made after looking both at the reviews, and at the price: I’d like to accumulate a good number of books on Norse mythology over time, and because of this I’m very aware of cost, and format. I can highlight and annotate the kindle edition to my heart’s content, without having to mar a paper or hardback with a highlighter or pen (and try read my own handwriting in the margins, later). With Norse Mythology, I think that Lindow is attempting to create a resource for general readers with an additional layer of scholarship behind it, and I think he accomplishes this splendidly. As a non-scholar, most of my exposure to the Norse myths has been through stories – as a kid, and to a lesser extent as an adult. I knew about Ragnarok, and the world tree, and Loki (I don’t think you can count Thor and Thor: The Dark World as mythological knowledge). Lindow presents the gods, goddesses, giants and monsters in a style closer to entries in an encyclopedia than as stories; the stories are still there, but they’re presented in relation to the gods, giants and monsters that they are connected to, and though this does result in some repetition, that same repetition allows a reader to see how the characters overlap. For someone with existing, general knowledge, the text serves to add details and deepen understanding, with the certainty of scholarship behind it. Though in some ways, I probably should have read a more story-oriented resource before working through Lindow’s work (after not having read any Norse myths for a long time), I think that reading Norse Mythology: A guide to the Gods, Heroes, Rituals, and Beliefs was ultimately a good choice – I feel sure that the book is going to be the foundation on which I build my future reading of Norse myths – because of the information in it, but also because it gives me added confidence that as I hunt down other sources, I’ll be able to better evaluate them. If you’re looking for a comprehensive but readable work covering the world of Norse mythology, existing somewhere between “stories of the Norse gods” and a scholarly text, Norse Mythology: A Guide to the Gods, Heroes, Rituals, and Beliefs is a great place to start. I have a general mythology of the world guide but not one specifically on Norse myth so this is worth checking out. I might see if I can get it at the public or university libraries first because I’m not sure I want to delve that deeply into it. That book looks charming! You should check out the Lindow book at the library. I’d like to grow a library of mythology books (because I want to blog about mythology), but I always check them out at the library first. At some point, I’m going to have to read some of the original source material, but I didn’t want to start with the hardest.